TONY BLAIR HAS had no discussions about working for US President Donald Trump, his spokesman said today after reports that the former British prime minister sought to become his Middle East adviser. According to The Mail on Sunday newspaper, Blair met with Trump’s son-in-law and key aide Jared Kushner last week to discuss taking a role with Trump. The paper said Blair had met Kushner three times since September. But a statement on his website later said: “The story in The Mail on Sunday is an invention. After leaving office in 2007, Blair was the envoy of the Middle East Quartet until 2015. The group comprises the European Union, Russia, the United Nations and the United States. 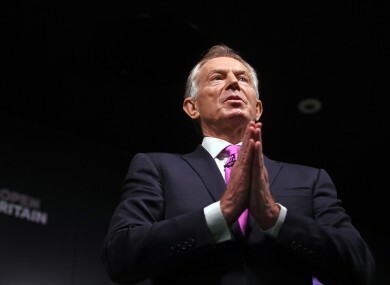 Blair was prime minister from 1997 to 2007, winning three general elections but his role in leading Britain into the war in Iraq has badly damaged his legacy at home. However, he has been making more interventions in British politics since leaving his Middle East role. Last month he urged Britons who support the European Union to “rise up” and persuade Brexit voters to change their mind about leaving the bloc, in a high-profile speech. Blair wrote an article in The New York Times newspaper on Friday where he called for a centrist new coalition that is “popular, not populist”, in order for liberal democracy to survive and thrive in the face of rightist populism. Email “Blair denies report that he's taking a job with Donald Trump”. Feedback on “Blair denies report that he's taking a job with Donald Trump”.